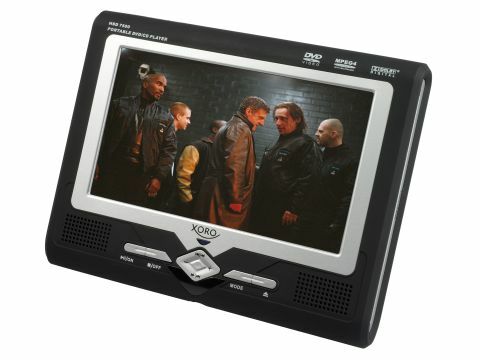 In a diversion from the standard flip-top design, the Xoro HSD 7500 portable DVD player uses a slot-loading disc drive and flat tablet design. This slim-line design means that the supplied Freeview tuner is an additional, clip-on device. The Freeview tuner plugs into the left hand side of the player and has its channel changing buttons and aerial input. The additional size of this tuner does render the player a trifle cumbersome, but the rubberised black finish makes for easy handling on the move. An adaptor is also included for in-car use, as well as a rechargeable battery. Connectivity is predictably minimal. There's an AV input/output connector (composite video) through which you can plug in an external device or for plugging this Xoro into a larger TV screen. Optical digital audio output, USB and SD card connections are also included. There's a basic EPG menu that can be browsed programme by programme. There's no facility to view day by day, however. You can switch between TV and radio channels with the push of a button and create a favourites list. In theory, that is. No digital stations were tuned in using the supplied magnetic external aerial. This may be due to being out of the digital signal area, but this may present problems when being used on the move. The 7in LCD screen itself has a good viewing angle - there's not that much deterioration when you look at the screen off-centre. Pictures have a pleasing colour palette. There's not even that much artefacting to report, but on-screen text (such as DVD menus) can be tricky to read. Slotting a DVD of The Proposition into the Xoro, reveals it to be a neat little portable DVD performer: the gritty western's arid landscapes are rendered with crispness and clarity. The visual downside is that dark scenes can look a bit grey and washed out, but considering the screen size, they're not bad. It does have an irritating habit of setting itself to the default subtitle setting, however. In addition to DVD playback (region 2 only), the Xoro is capable of playing most recordable disc formats, MP3s and MPEG4s. Sonically speaking, the built-in speakers sound puny. The supplied in-ear headphones aren't much of an improvement, so get some noise-cancellers instead. This Xoro is a credible DVD performer, but the low battery life and Freeview foibles could become irritating while you're travelling. Pack a good book too.